Network Infrastructure security solutions enable you to see, manage, and secure your entire network of physical and virtual devices. Gather information and analyze behavior of your network - configure devices, see traffic and develop, deploy, and enforce policies. Reduce risk across the network by leveraging intelligence to Identify network vulnerabilities and block attacks. Cisco security solutions deliver effective network security and incident response. Cisco offers integrated security across the network, cloud, Internet, email, and endpoints. Juniper network security management reduces manual tasks and human errors by simplifying administration with security policy and workflow tools through a centralized management interface. Juniper's Junos Space Security Director is a comprehensive network security management solution that combines intuitive and advanced security visibility with automated policy management. It has an easy-to-use wizard driven interface, granular configuration options, and predefined profiles for deploying devices and security services. 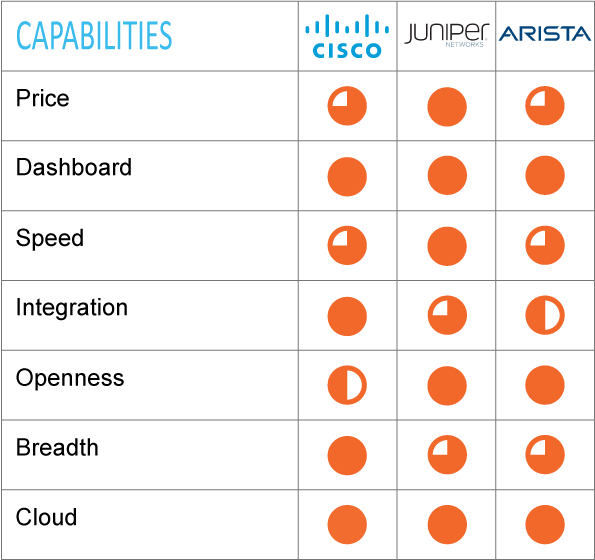 Arista Networks is a leader in building scalable, high-performance and ultra-low-latency networks. They deliver platforms for software driven cloud networking. Arista Networks' scalable, efficient, and reliable high performance universal Cloud Network architecture is delivered with an extensible operating system – Arista EOS® that is programmable at all levels giving the granular control needed in large organizations. Arista's software driven Cloud Networking provides software driven visibility and control to IT security teams.